A breakaway Karen armed group, the Democratic Karen Buddhist Army, said in a public statement that they welcomed the recent ‘peace talks’ between the Karen National Union and the Burma government, but warned that the if the ‘talks’ are to succeed KNU fighters will have to stop their attacks on the Burma Army in Brigade 6. The statement issued from the DKBA’s Klo Htoo Baw Headquarters said that the KNU dialogue with the Burma government has to base on honesty, openness and a genuine intention to reach a peaceful solution. The DKBA said its statement was in response to KNU request, before their January 12th ‘talks’ with a government delegation in Pa-an, for all Karen organisations and people to have input to the KNU peace committee. The DKBA foreign ministry spokeperson Major Saw Lote Lone told Karen News. The DKBA, Klo Htoo Baw statement, noted that the KNU met with Burma government representatives three times by the end of 2011 and have developed a peace committee, but this month the KNLA Brigade 6 soldiers based in the Dooplaya district attack government troops three times. 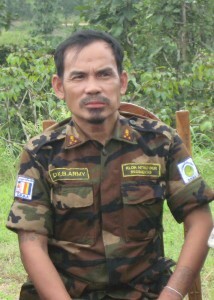 A DKBA leader, Maj.General Saw Lah Pweh, (also known as Na Kham Mway) in an interview with Karen News said. In response to the DKBA statement the KNU vice-secretary, Saw Hla Ngwe, told Karen News. The DKBA broke away from the KNU in 1994 and were aligned and sponsored by Burma’s military until November 2010 when Maj.General Saw Ler Pweh opposed the national election, the Burma Army and sacked the Burma border town of Myawaddy. On the 11th December 2011 the DKBA led by Maj. General Saw Lah Pweh met with Burma government official and signed a six-point ceasefire agreement.